Different ways to use our products! Our products are not just the safest and most effective cleaning products on the market, they also provide a variety of ways that they can be used, simply because they contain no harsh ingredients! Our fantastic customers have demonstrated how to make use of our products in so many more ways than just cleaning their bikes! Our Pro-Wipes were designed for on the go use for your hands and bike helmets; but our sponsored team BPF have other ideas; cleaning their training gym with our wipes! 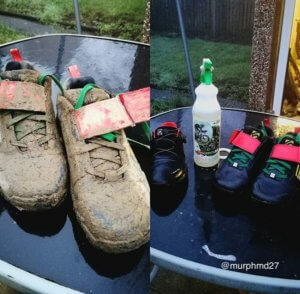 Our Bike Wash is well known for its effectiveness but it can also be used on your cycling shoes, boots, helmets & kits! 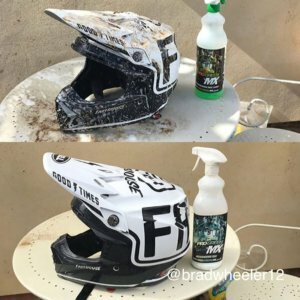 What is better and easier than one product you can clean everything with? 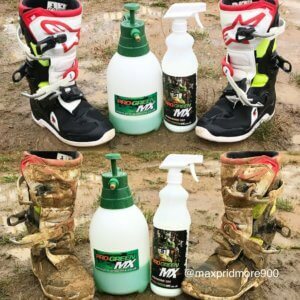 For shoes, boots and helmets: simply spray on, leave to soak and rinse. For kit: put on a hanger, spray on, leave to soak and put in the washing machine alongside your normal detergent to remove all those grass, mud and clay stains! It’s fair to say most of you that own a bike also own a vehicle… Well rather than purchasing a product to bring your tyres up nice and your bumper plastics back to black just spray After-Shine 101 to your tyres and black plastics and leave to do its job for that clean look! (No rinsing or microfibre cloth required). As well as being amazing at cleaning up your chain and engine this degreaser just eats through dirt & grime! 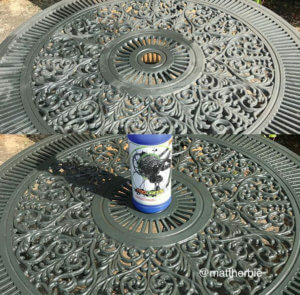 Here one of our customers found an old table in storage which came up gleaming with some TLC from our Drivetrain Cleaner. In order to stop you from having to tear into the seals of a brand new pair of goggles, we created Fog-Away to specifically prevent your goggles from steaming up whilst riding. However, Fog-Away is that good at its job you can also use it on your bathroom mirror (which we all know is a nightmare for when you want to shave after a shower)! Apply 3-5 coats of Fog-Away to a clean mirror and watch how the steam from the shower no longer affects your mirror! There are of course many more ways that our products can be used, but the above are some of our favourites! 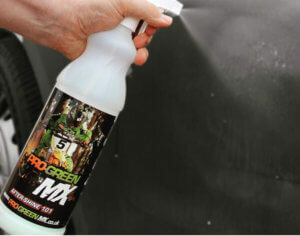 All of our products are salt-free and completely safe to use on any surface! We’ve had customer feedback from cleaning their concrete driveway to their kitchen with some of our products as well as keeping their bikes gleaming all year round!